I love to find cheap things, but I love to find FREE things even more! So today I thought I would share a few of the ways I acquire free stuff. 1. Craigslist I am told that not all cities have a free section on their Craigslist but ours is located right under the “for sale wanted” section. I check the listings a few times a week just to see what is available. Here is a sampling of what can be found for FREE in my listings right now. And I have only listed the items which include pictures! Free 9 drawer dresser. We’ve been seeing a lot of these 70’s dressers around the blogosphere spray painted in fun colors lately. Free playhouse. Given a fresh coat of paint this could turn into a real gem! Free desk. Paint it white or black, add new hardware, and it’s perfect. Free chair. Reupholster in a graphic print, paint and distress the wood and you have yourself a great conversation piece. Free step tables from a store display. These could be fun storage in my master closet. Free mannequin. Great for modeling one’s etsy goods. Free headboard. Cut off the bottom legs, paint and distress, add hooks, and hang in your front entryway. Okay, so that was what I found just from looking at what was available in the listings this past week! 2. Freecycle.org Freecycle is a world-wide organization designed to hook people up with free stuff. Our local freecycle group utilizes yahoo groups as their communication forum. In order to be a part of the group, I had to “apply” to be accepted to the yahoo group. The disadvantage of my group is that it completely clogs up my email. I have the messages programmed to be sent to my spam folder, but this makes it difficult to score finds. The forum also does not include pictures which makes it difficult to know if the items are worth your time. All that being said, it is a great way to receive needed items. I have seen many people post “wanted” ads on freecycle and receive exactly what they were asking for. 4. Garage Sales You have always heard that if you want to score the best stuff at garage sales then arrive early. This is good advice if you are willing to pay. If you want free stuff, then arrive late in the day! Most people will be ready to give away what is left. Score! So how about you? Any tips on how you score good stuff cheap/free? Please do share! I just found your blog, and love it! I found that very same dresser (top) on the curb and turned it into a headboard. I *love* finding stuff for free! The white headboard you show is beautiful!! Great post. I don't usually find anything in the free section of CL, but it's worth looking every now and then. freecycle is amazing to me. the only other thing i've personally been a part of for free stuff -is a clothes swap party. which is so stickin fun if you go with friends. bring 8-10 pieces of "good condition" clothing that you are willing to give up for free in exchange for someone else's "good condition" clothing. so fun. usually everyone brings a treat for all to share as well. would LOVE to have the dresser in the first pic! That reminds me, I did apply for that group Freecycle on Yahoo but never got an acceptance notification. Maybe I was disqualified. Ha! Great tips. I didn't know about the free listing. Have to check it out. Wonderful free tips! 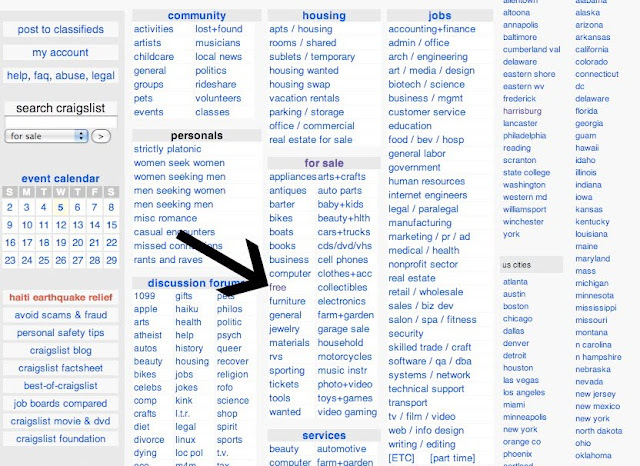 I've never thought to look at Craigslist for free items. . . now I'm intrigued! I have to laugh…because I came to your site directly from the Craigslist FREE section. I check it frequently since the free stuff goes SO fast! I love the free section at Craigslist, I look at it every few days, between that and curb side savings on big trash days I'm in need of a truck and trailer LOL. and most people here don't post pics which is what i look for before i check its availability. i joined freecycle last year and it has paid off, just received 10 burlap coffee sacks. they are huge and pretty cool. can't wait 'til i get a chance to make something with them! i love garage sales as well for freebies. last year one home had an 8 ft. table of free stuff and it was still the middle of the day. it was great. i'm with you about the emotional attachment, however, my "storage" area is busting at the seams and needs some attention! You're free Craigslist section is MUCH better than mine. Ours never has anything good. I would LOVE to have that desk. Or dresser. Too bad you aren't within drivng distance!